Rare and one of a kind, this modern yet vintage-inspired ring is beautifully crafted in 14 Karat white & yellow gold, embellished with ornate filigree milgrain swirls. Clusters of Diamonds are bead set in a detailed square of white gold adding a touch of class and elegance to the wearer's hand. 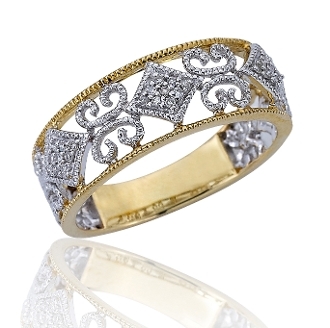 Both intricate and eye-catching, this ring is complete with yellow gold milgrain edging and 0.09 Carat t.w. Diamonds. For added appeal personalize your item, select our engrave option and indicate size needed when adding to cart.